in San Francisco, we introduced new reports that will help you measure how to do this in two meaningful ways. We’re happy to announce that Mobile App Analytics will now let you understand how users come back to your app day after day, and provide the rich insights you need in order to measure their value over time. Let’s take a look at how these new reports can help make your app a hit. The active user report displays your 1-day, 7-day, 14-day and 30-day trailing active users next to each other in one, easy-to-view dashboard. The new overview gives immediate insights into how users interact with your app over time, along with dropoff rate comparisons. With this report, an app download is only the beginning of a potentially valuable relationship with your new users. While these metrics help you monitor your active user trends, when put into context they can answer important questions about your user acquisition strategies. For example, if you are investing in different campaigns, you can compare the cost of retaining users acquired via paid traffic versus organic to understand if you are attracting the right type of users. Not only can you measure your cost effectiveness, but you can also continue to monitor whether or not the users you paid for are still coming back after the campaign is over. This is particularly important when trying to keep your loyal user base engaged and happy with your app. After learning how many users have opened your app, the next step in driving engagement is understanding when they come back. Cohort Analysis is a user analysis technique that allows you to analyze and compare your users by looking at their customer journey. Using Cohort Analysis, you can see when users are coming back to your app and their behavior over time after the day of the first session, and lets you further filter the information by day, week or month. We’ve also added the ability to compare different segments of users based on the day of the first install. 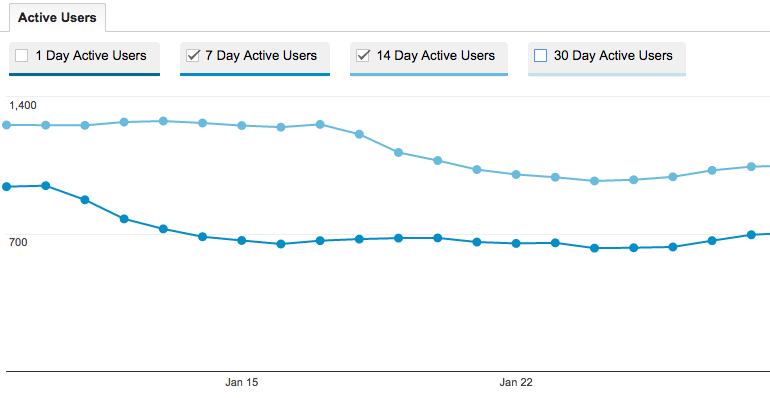 Analyzing retention is a great way to ensure users stick with your app and come back day after day. With Lifetime Value reporting, you’ll get a full picture of these users’ value over time. To get the most out of this report, it’s important to start with a clear definition of what a user’s value means to you based on your business objectives. Once you’ve defined the value, you can access the report to measure certain variables such as revenue per user and number of screen views per user over a period of 90 days. For example, if the goal of your app is to get users to purchase virtual or material goods, you’ll want to use this report to get a clear view of when they make a purchase and how much they are spending in your app over time. Lifetime Value is a key metric to use to measure the effectiveness of your acquisition campaigns. If your cost to acquire a new user is higher than the average value over time, you might want to optimize your campaigns to meet the lifetime revenue they generate. Lifetime Value is particularly valuable if you offer in-app purchases, but it can be applied to discovering many other useful insights, such as number of times they open your app, total number of screens and goal completions. Cohort Analysis report can be found under the ‘Audience’ section in your Google Analytics account, and is now available in beta. 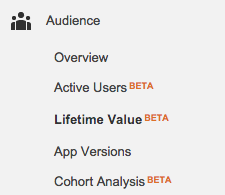 Lifetime Value and Active Users reports are coming soon to all Analytics accounts. To get started login into your Analytics account and look for the new reports under the Audience section. Successful developers understand that in order to have a popular app, focusing on retaining a loyal user base is just as important as driving new installs. Today at the Game Developer Conference in San Francisco, we introduced new reports that will help you measure how to do this in two meaningful ways. We’re happy to announce that Mobile App Analytics will now let you understand how users come back to your app day after day, and provide the rich insights you need in order to measure their value over time. Let’s take a look at how these new reports can help make your app a hit.